Well this one has been in the works for quite some time. I've had several requests for a milking option and I've finally got it close to my desired result. The milking option is done a random number of times before they are done. 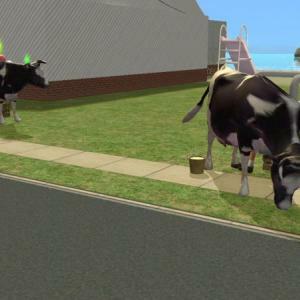 When the Sims starts milking a crate and pail of milk appears, the animations are a little quirky, I just tried to make it look like they are having some fun. The fingers are really hard to get in a good position, at least for me. 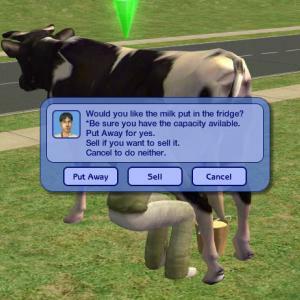 Once the Sims is done milking a dialog box will appear, and the crate will disappear underneath them (I almost gave up on this option, but I finally got it to work), anyway the dialog box will allow you to have them put the milk in the fridge or sell it for $25. It will give 25 food units to the fridge, be sure you have the the capacity to allow for it to be put away. I worked on the riding animations but they still have a glide appearance, if this bothers you please don't download it. It is the best I could do. 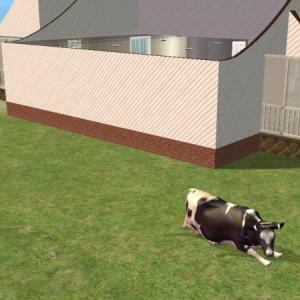 I've added a relax pose this option doesn't give any fun or anything it's just to pose the cow. There is a get up option to make them stand back up too. The graze option and eat option work similar to viewing a picture. Sims will gain fun will using these options but have to be directed to do something else unless their needs get low. All options are non autonomous except the milking option. 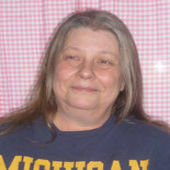 This is found under Hobbies/Exercise, because when riding adults, teens and elders gain fitness, and body skills. If you have my previous version please delete the files. This will conflict with it. You will also need to replace any on your lots with the new version, I totally rebuilt the skelton. Your older versions will have strange looking bodies. 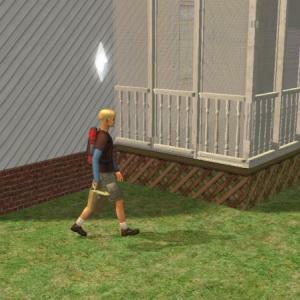 If you use testingcheats enables true you may get an error if you cancel the ride option, it is best to direct the Sims to go to another action to prevent this error, or just click on the ground and direct the sims to go here. When they pick up the pail of milk they do bleed into the cow, sorry I just could not find a way around this. 5000 approx spread over 3 tiles. Thank you for this! It will be wonderful on my farm!